Our organization is well known in the industry, engaged in offering a broad range of Leatherite Venetian Blind to our prestigious clients. • A very wide collection of exclusive colours and patterns. • Comprehensive colour co-ordination in every part of the blind. • Carefully designed appearance, down to the last detail. Venetian Blind(Tilt and Turn) in DGU is operated with the magnetic mechanism in the housing outside the DGU and the unit is fixed on the top of the glass. The blinds can only have tilt function, no movement of the blind either up or down. We are indulged in offering Venetian Blinds to our clients. 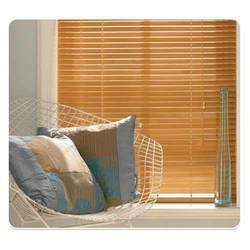 Available with us is a wide variety of blinds which is made by using quality basic material. Our comprehensive range of blinds is used for reflecting the sun rays away and absorbing the surrounding sound for in order to make the room cool and quiet. - a venetian blind has horizontal slats, one slat above another. They are suspended by strips of cloth called tapes or by cords which are able to tip them each at the same time up to 180 degrees. We offer extensive range of Wooden Blinds, which are elegantly designed to enhance the beauty and ambiance. These wooden blinds have a smooth finish and make the blinds vibrant. They can withstand any climatic conditions and are durable. As per the clients requirements the blinds can be designed and sized. Our Venetian Blinds are available with Aluminium and Wooden slats and are available in a plethora of shades, which allows you to match them to any décor, and thus helping in create a beautiful and custom environment. With the help of our adroit professionals, we have been offering a wide assortment of Venetian Window Blinds. Manufacturing an exotic range of venetian blind with self aligning system, we offer superior quality product which adds on attractive looks to the interiors. 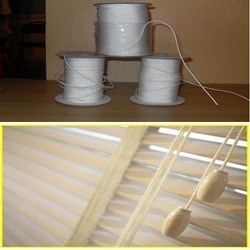 Delivering an effect of curtains these venetian blinds are available in variety of styles.